It was my Aunts Birthday last weekend, so of course I had to make her something. She loves buttons and the colors pink and purple. 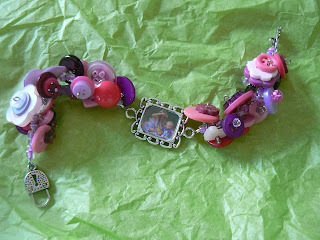 I made her this button dangle bracelet with a picture charm. I make dangle bracelets quite often, but never with buttons. I love how it turned out, and so did she! Gina saw me working on the bracelet and she thought she needed to make a necklace for her Aunt Kimmy. 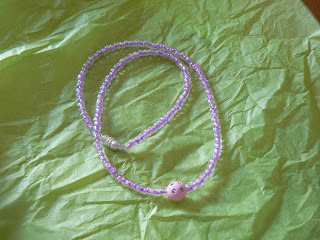 She picked out these purple shimmery beads and a "diamond" pink bead. She strung them all herself, the whole time declaring, "I love doing arts & crafts!" Makes me smile! I LOVE the bracelet! Perfection! 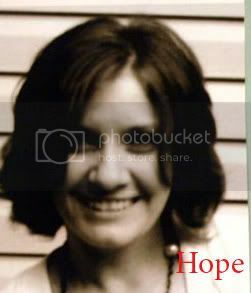 Lucky lucy aunt. Cute bracelets. How sweet your daughter love to craft at such a young age. Great bracelet. I love buttons.